Identify known and unknown risk, track customer behaviour to detect anomalies and reduce risk. Insurance company is exposed to many risks. Thus, risk management is highly critical for the success of any insurance company as it directly affects the bottom line. Environment changes and calamities have forced insurance companies to reconsider their products and offerings and to better manage their assets and liabilities. it’s imperative for insurance companies to improve their financial risk management processes to withstand unforeseen calamities. On the other hand, there is an incessant growth in the number of fraudulent claims as more and more groups are sprouting with malicious intent. 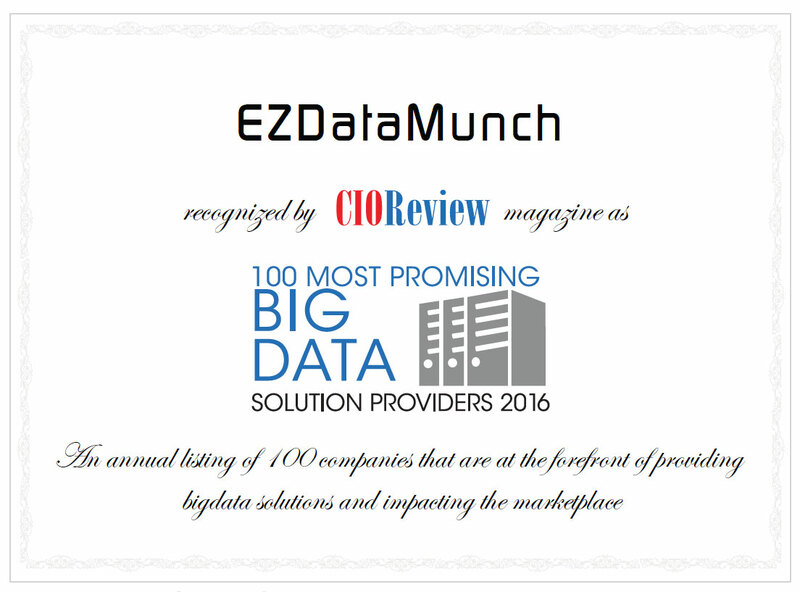 EzDataMunch provides pre-built risk analytics dashboards that is a part of insurance analytics solutions. 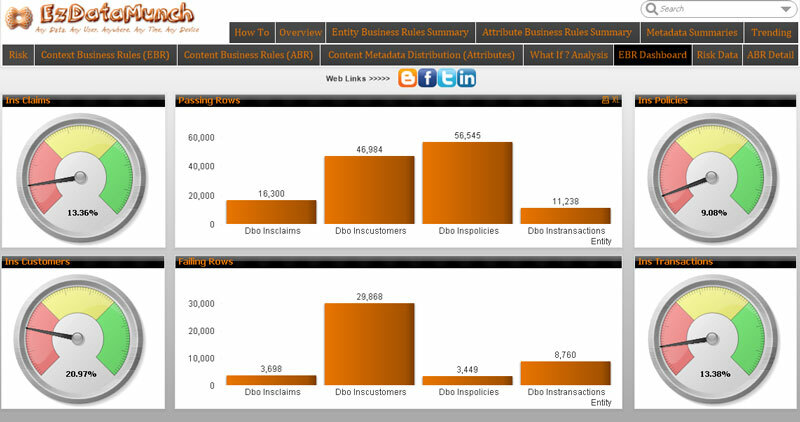 These dashboards help insurance companies to have a deeper and real-time knowledge of the risk. Risk pertaining to accounts, products and more can be viewed. These reports can be used to better understand existing business rules, identify risks, track frauds and maintain profitable asset management mechanism. A study proves that 10 % of claims are fraud. Organized crimes in this area is increasing at an alarming rate. There are many other risks faced by insurance companies at the same time. And, they have to abide by stringent regulatory rules to provide transparency to customers. Get detailed overview of the risk. The risk information presented in pie charts is defined by various business rules of the company. 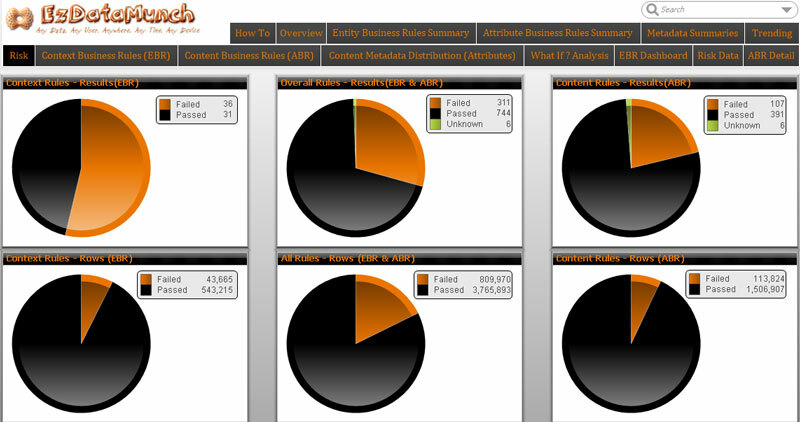 These pie charts showcases various business rules and pass / fail ratio pertaining to every rule. Risk management has the option to have a comprehensive drilled down report that shows risk involved at various phases. This report is highly interactive and easy to understand. The dashboard consists of failing and passing rows. These rows represents risk involved at multiple touch points of insurance life cycle. These touch points can start from application filing to claims disbursement. Pie chart consists the distribution of failing rows as per the entities. This report also gives metadata information that describes the entity in details and presents the dollar value of failing rows. The level of risk keeps on changing with time and other factors. Risk management always look for ways to reduce risk by predicting it. They need a robust tool that can help them analyze risk at every event or touch point and minimize it make informed decisions. Create various scenarios to test the risk at by gauging the impact of minor changes. 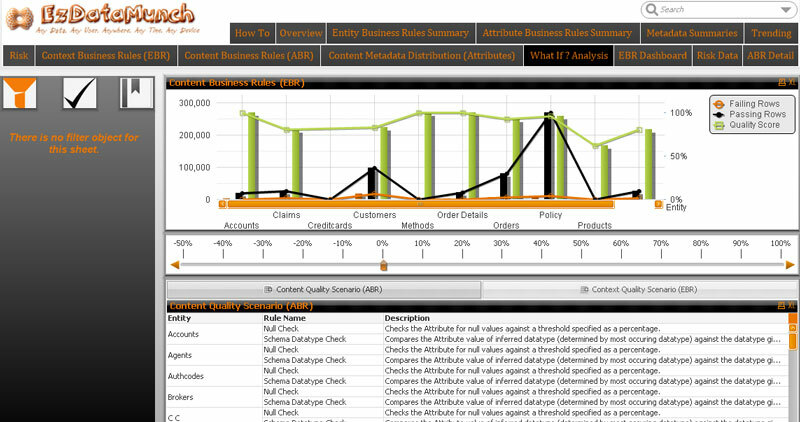 Scenarios can be created by combining the factors like business rules, customers, claims, accounts, products and more. An insurance company is as good or secured as its business rules. A business rule provides a platform for insurance companies to act upon and defines risk appetite. Business rules also provide safety net to insurance companies from fraud claims and helps in improving bottom line. Thus it’s imperative to have real time insight in the insurance operations and to ensure that these operations are synchronized with business rules. Analyze business rules by providing a comprehensive set of dashboards that comprises all the business rules made by the company. Define categories of business rules such as Entity business rules, attribute business rules, context business rules and content business rules. Each business rules showcases different phase or aspect of insurance life cycle. 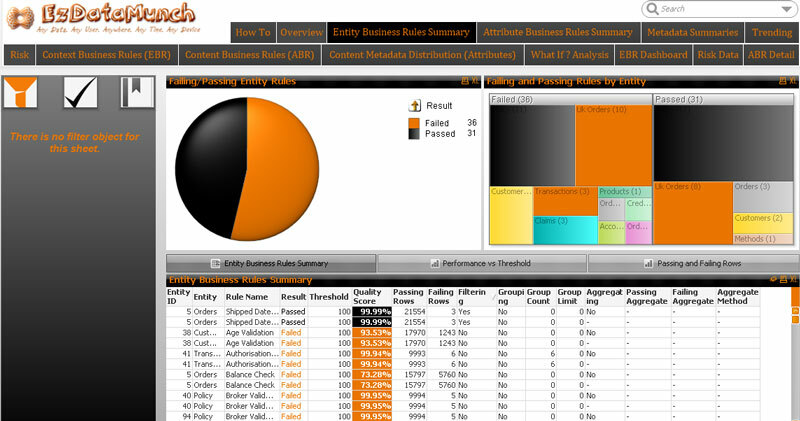 Analyze every set of business rules in details. 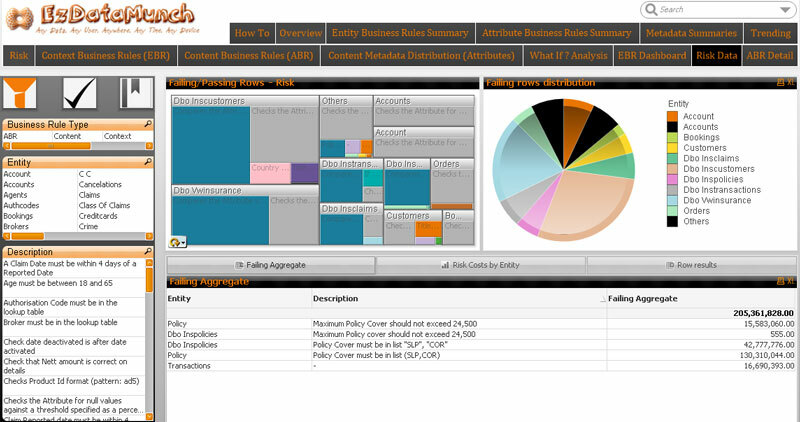 Here the entity business rules dashboard gives insight in to the failed and passed rules in pie chart format and rows format. Also, the metadata gives deeper information about every entity at individual level. Key elements like passed and failed ratio can be seen. Also quality score can be measured as per the performance of entities. Similarly other business rules gives details about the factors they encompass in a simple fashion. Key KPIs for health insurance analytics.